Electric effect: Electrically stimulating a certain nerve bundle in the brain (bottom) leads to the birth of new neurons (green, red and yellow) in the hippocampus, which governs learning and memory. Electrically stimulating a particular circuit in the brain improves learning and memory in a mouse model of Rett syndrome. The findings, detailed 14 October in Nature, suggest that some of the cognitive problems associated with the syndrome are reversible1. Cognitive impairment is a core feature of Rett syndrome, which primarily affects girls. The new findings raise the possibility that deep brain stimulation — an invasive technique that involves embedding electrodes in the brain — could ease cognitive problems in people with Rett syndrome and related conditions such as autism. “Here’s a symptom that’s shared by so many individuals, no matter what the cause is,” says Huda Zoghbi, director of the Jan and Dan Duncan Neurological Research Institute at Texas Children’s Hospital in Houston. “We thought that if you can target the circuit that mediates that symptom, then you might discover an approach that could be applied to many of these disorders.” Zoghbi led the study along with Jianrong Tang, a neurophysiologist at the same institution. Doctors currently use deep brain stimulation in people with Parkinson’s disease to ameliorate debilitating motor symptoms such as tremors and rigidity. Researchers are also testing the treatment in people with Alzheimer’s disease and depression. Zoghbi and her team surgically implanted electrodes in the brains of female mice missing a copy of the MeCP2 gene, which is mutated in people with Rett syndrome. They positioned the electrodes to stimulate a nerve bundle that connects to the brain’s memory center, the hippocampus. The researchers stimulated the this nerve bundle in the mice for an hour each day for two weeks. Control mice missing MeCP2 were implanted with electrodes but did not receive stimulation. Three weeks later, the mice that received the stimulation performed better than those that did not on learning and memory tests. In one test, for example, the treated mice were more likely to remember the context in which they received an unpleasant (but harmless) electric shock to their feet. They were also more efficient at finding a hidden platform in a pool of water. Contextual and spatial memory are both thought to require the hippocampus. 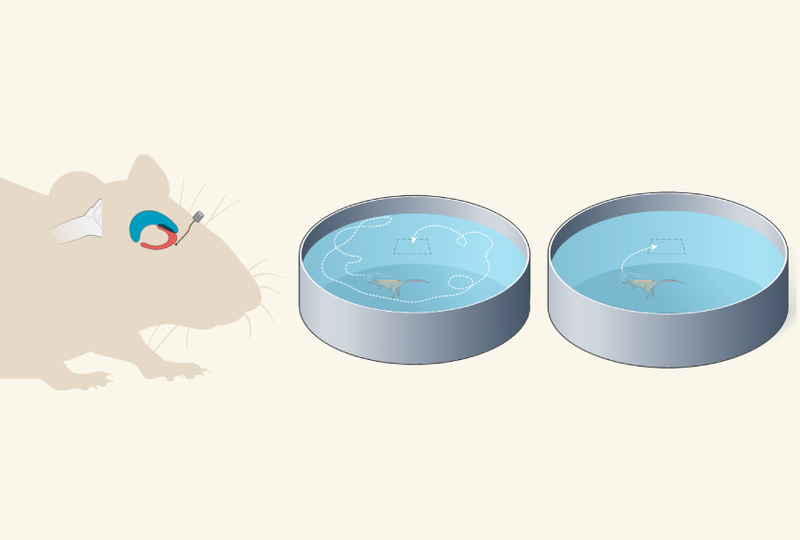 The researchers then took a closer look at the treatment’s effects on neurons in awake and freely moving mice. No one knows exactly how deep brain stimulation works. It might alter the connections between neurons, or enhance or inhibit neuronal activity2. 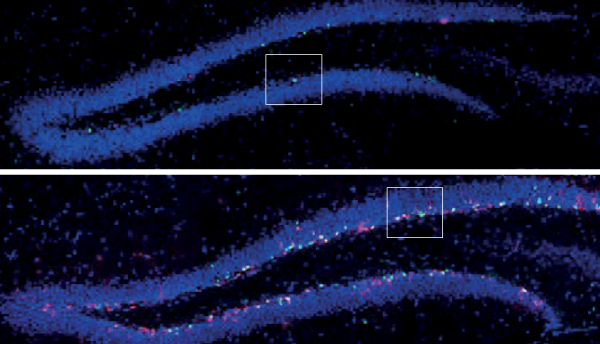 Zoghbi and her team found that in this case, the treatment enhances communication between neurons in the hippocampus — a process believed to underlie learning and memory. Using brain slices from the hippocampus, they found that the treatment also spurs the production of new neurons. It is still unclear, however, whether these brain changes are responsible for the altered behavior in the mice. Short circuit: Stimulating a nerve bundle in mice modeling Rett syndrome enhances their ability to find a hidden platform in a pool of water. The treatment did not improve other symptoms of Rett syndrome, such as movement problems, anxiety and social deficits. Nor did it trigger seizures or cause any other obvious side effects. It’s possible that stimulating other brain circuits might ease social and motor symptoms in Rett syndrome, Sur says. But he and others caution that the treatment needs more study before trying it in children, as it may have unforeseen effects on the developing brain.